Grafting is essential to fruit tree propagation. Using the scion wood you essentially create a clone of your parent tree and so keep the variety true to form. Fruit varieties cannot be propagated any other way. To produce a tree of a known variety, you need to graft from material of that variety. To do this with fruit trees you take scions (essentially new twigs) or buds, and graft them on to a new rootstock. You then have the roots of one tree, and the branches, leaves and fruits of another: your chosen fruit variety. In fact most fruit trees are cultivated like this as fruit tree varieties don’t grow true from pips. If you plant the pip of a Bramley’s Seedling apple, the resultant tree will be an apple, but not a Bramley. To get a Bramley, you need to cut off a scion or a vegetative bud, and graft it on to a rootstock. Grafting essentially clones the tree, growing a new tree with the exact genetic makeup as the source, preserving the variety true to form. If you think about it, this means all Bramley trees have exactly the same genetic makeup as that first original tree. It might sound like a daunting process but grafting can actually be quite straight forward. As long as you follow a few simple rules, you should find that you make successful grafts from the start. The two most crucial considerations for successful grafting are timing, and cambium contact. These will vary depending on the types of graft you are attempting. Understanding the cambium layer is crucial to grafting success. The cambium is a layer of tissue just under the tree rind. In the growing season this will look a green colour, and slightly translucent compared to the tissue either side. This is the layer of active growth in fruit trees, growing to produce the tubes that carry water and sugars around the tree. 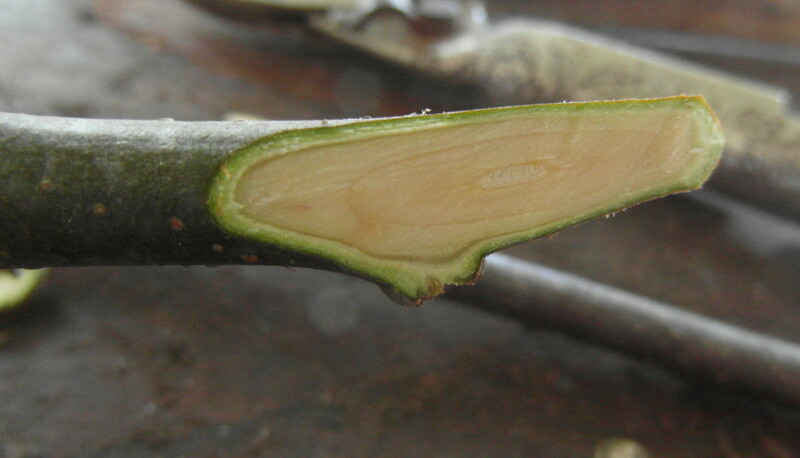 For a graft to be successful, the cambium layer of the rootstock and the cambium layer of the scion or bud need to be held in contact. These layers then grow together forming a healthy graft union. Any method that joins the cambium layer of compatible components together, with sufficiently favourable growth conditions has the potential to achieve a graft union. Although it is only necessary to have a small area of cambial contact, larger and firm contact is more likely to give you swift establishment and an effective union. One of your first considerations, as with any tree propagation, is deciding what size of tree you wold like. The rootstock you chose has a big influence on the final size and vigour of your tree, as well as how long your tree will live and at what stage it comes into full fruit production. We recommend using rootstock that produces close to full sized standard trees, such as M25, M111 or seedling rootstock. Although these trees take longer to get to full fruit production, they will give a heavier crop when in full fruit, they will live longer than trees on dwarfing rootstock and they mature to provide the veteran tree features that make orchards so valuable to wildlife. A scion is a piece of vegetative material taken from a tree that produces the fruit variety you want to graft. Information on scion selection will help you know what type of material to collect and when. For bench grafting, scions are collected in the winter when the trees are dormant. Click here for instructions and a video on selecting scion wood. Bench grafting is where you graft a piece of scion wood onto a rootstock to grow a new tree. It is carried out in late winter or early spring, using dormant scion wood from a tree of the variety you want to propagate. There are many different methods of the bench graft, but the whip and tongue is a good one with high success rates. Follow the link for instructions and a video tutorial. Bud grafting, or chip budding, is a different way to get the same result. It involves grafting the vegetative bud from your chosen tree variety to a rootstock. It is different, however, in that it is done over the summer months, and doesn’t need dormant scion material so can be done with material gathered when your trees are in leaf. Again, there are many methods of bud grafting but here is a guide to chip budding. Follow the link for instructions and a video tutorial. Framework grafting is something slightly different from bench grafting or chip budding. The end result isn’t a new tree, but a tree that grows a new variety from before. It is a process that uses the framework of a tree, (the trunk and branches) but grafts scions of a different variety to replace the fruit producing branches so that it changes the tree’s variety. This is a less common practice and requires a number of different types of graft, detailed in the framework grafting guide. Follow the link for instructions.